The Baku Bears Rangers Supporters Club was formed in 2003, when a group of Glasgow Rangers supporters, working here in the oil industry in Baku, Azerbaijan, decided that they would meet socially to watch on television, or in those olden days listen to radio commentary of their teams football games being played back home in Scotland or Europe. During one of the early club meetings, a decision was taken, that the club should look towards trying to put something of benefit into the local community and a few objectives would be set while our expatriate workforce were working in Azerbaijan. It was the consensus of the members that, as our background was of a football and sporting origin, we could sponsor a local youth football team, which further developed into promotion of Baku Youth Football Development Program. In the hope that maybe we would find a player good enough to play for Glasgow Rangers back in Scotland. After reviewing the local prospects we were privileged to gain acquaintance with Sadiq Garibov, who has a keen interest in various sporting activities in Baku. Sadiq in turn introduced the club to Fazil A. Eyubov who was Director of Football Coaching at the The Republic of Azerbaijan Football Academy located in the 8th Micro Region District of Baku. 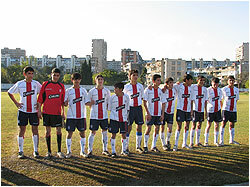 The Baku Bears club opted to sponsor under 15 year age team, and supplied them with replica Rangers football strips and boots. The team took on the new name of Baku Rangers in our honor. First objective achieved. The next year, the club increased the sponsorship to an under 13 year old age group and further replica strips and additional training kits, football boots etc were supplied. The kits are replenished on a yearly basis. Second objective achieved. 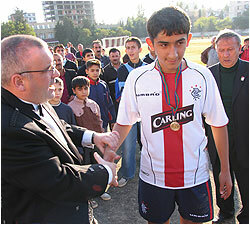 The Republic of Azerbaijan Football Academy was also being used by 17 other local teams, 300 local youths under the age of 16. The facilities were in a very poor condition in relation to hygiene and safety. Following some design issues and feasibility studies. It was decided by the members of the Baku Bears RSC, that facilities would be refurbished to an acceptable standard. But this could not be achieved by the Baku Bears alone. A high publicity fund raising scheme was required to achieve the cash required to carry out the refurbishment program. Oil industry related companies working within Baku were approached for donations to aid the project. This was achieved by monitory, material or labour donations. After almost a year of fund raising and a lot of hard work by a lot of people the stadium was refurbished with modern training facilities, which would be the envy of some professional teams and opened on the 23rd October 2005. It was renamed as Baku Ibrox, after the Glasgow Rangers stadium back home in Scotland. 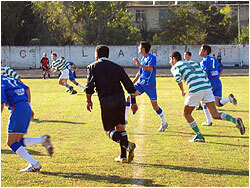 As part of the opening program, and now an annual event, the first Old Firm football match in a former Soviet State took place. 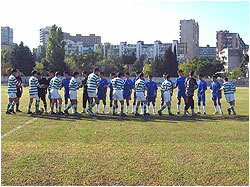 Baku Rangers youth team were matched against Sahil Celtic, as sponsored by the Bhoys of Baku CSC. These two clubs being great rivals, back home in Glasgow. This is also accompanied by an expatriate football match between Scotland and England. Again this has now become an annual event. Third objective achieved. On the Sunday of the 23rd of September, we were privileged to witness the first “Old Firm Game” in Azerbaijan. 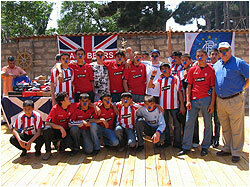 “Baku Rangers” as sponsored by the Baku Bears RSC were faced by “Sahil Celtic” as sponsored by the Bhoys Of Baku CSC. A high standard display of football was provided, from two young teams, being supported and encouraged by enthusiastic groups of supporters from both the expat and local communities. A nail biting game from start to finish, which ended with a 1-1 draw. The penalty decider was even more stressful after the five penalty’s ending in a draw and moving to the sudden death stage. Eventual winners were Baku Rangers, who won 6-5 on penalties. Medals and trophies were presented to winning and losing teams. Donation of training equipment, to a modern gymnasium specification, from the East Azeri BP offshore operations crew was made to the club via platform management. This was accepted with great appreciation, but left us with a slight issue in where to locate it within the football academy complex. Again with the help of individuals this issue was sorted. A purpose built gymnasium was constructed and delivered to the stadium. Even down to the maintenance of the ground facilities itself, was considered. And with the assistance of another major charity fund raising organization we procured and delivered a power driven grass cutting device. All his Christmas’s and Birthdays had come early, the grounds man was in awe with his new equipment. It was last year that the hardest part of the proposal was still to come. How do we decide who goes to Scotland? A group of members were selected to appraise the lads at various football matches and after a great deal of studying of their form and ability, two lads, Jeyhun Huseynov and Adalat Mammadov were chosen to travel to Glasgow along with an adult interpreter/guardian Sadiq Garibov. Following many weeks of hardship counteracting red tape issues with visa acceptance, and even then this was only achievable through the last minute intervention of David Stewart. Sadiq, Jeyhun and Adalat attended a presentation of tickets, accommodation vouchers, spending money, Baku Bears merchandise and many more gifts to see them through their visit to Scotland. Taking into account that none of these lads had even been on a plane before, they left for Scotland on Sunday 5th August. A tremendous turnout of family and friends were at Heyder Aliyev airport to bid them Bon Voyage. The party was met at Glasgow International Airport and taken to the Rangers Residential Training Camp in Glasgow, where they completed all the required registration documents and checked into their accommodation. The following morning the lads were introduced to their coach Steven Tennent, who for the next 5 days would be putting them through an intense training program. They would be involved in training and technical coaching sessions during the day, and by evenings they would be taken to various venues in and around Glasgow. These would include visits to Ibrox Stadium and Super Store, Hampden Park, Scottish Football Museum and Glasgow Rangers Murray Park Training Facilities. Reports fed back from David and Steven were that, Adalat and Jeyhun commitment, technical skills and ability was performed to the highest levels and participated enthusiastically in all aspects of the course. Sadiq was providing excellent translation of activities and was also showing a positive aptitude to the development of new training techniques. Friendships were developed with the other participants, and I was assured that the name of the Baku Bears RSC was now well renowned within the younger community of soccer hopefuls in Scotland. Through the assistance of Baku Bears members at home on leave, the group also visited Loch Lomond (Duck Bay Marina), Braehead Shopping and Entertainment Center Xcape. And you can not visit Glasgow without visiting the infamous Glasgow Argyle Street. On the Saturday they were escorted by Mitch Hughes (BB member) and friends along to Ibrox Stadium to witness the home match between Rangers and St.Mirren. Prior to the game they made presentations on behalf of the BB RSC of the Baku Bears Player and Young Player of the Year awards to Alan McGregor and Charlie Adams respectively. They took in the game and enjoyed the delicacy of good old Jock pies and Bovril. A treat to behold, and they are still trying to get their mothers to replicate in Baku. Following the game it was out for a farewell meal and back to the Hotel to prepare for the early departure and journey home to Baku. Since their return Jeyhun, Adalat and Sadiq have informed the club, that they thoroughly enjoyed their whole experience and that the generosity and hospitality shown by everyone involved would be remembered for ever. The lads displayed their / our club flag with pride whilst in Scotland. Jeyhun, Adalat and Sadiq have also given interviews to local press back in Baku regarding their trip to Scotland, highlighting the high levels of training facilities available to youth development. They were in awe at how the modern football stadium facilities encompassed with the historical building of the Ibrox Main Stand. The visit to Scotland would not have been achievable without the support of our sponsors of the trip; John Wright & Allan MacDermaid – Weldspec (Accommodation and donation), Andy Townsley Peter Waddell – SDL (payment for the course itself), West Industries – Hagan Teymurov (donation of the flights), John McDonald (Digital Camera), Baku Bears and its members (Visa’s, Kit and spending money) and finally to the David Stewart of Rangers Soccer Schools, in helping out with the visa’s. Fourth objective achieved. That must be the history complete? I hear you ask yourself. Well no, not quite. With the influx of new members and new ideas for promotion of youth development there are future projects being under review at this present time. As the Baku Bears RSC in association with the Bhoys of Baku CSC we also raise funding for other charity organizations benefiting the local community. Recent challenges such as quiz nights and bowling nights have been well attended. And the recent joint charity auction raised an immense sum of $40,000. All proceeds being fed back into the community. As President of the Baku Bears RSC, I would like to thank everyone, both here in Baku and in the UK, who have contributed and provided support to all, our charity efforts, which we as a club have undertaken whilst residing in Azerbaijan. I can only express that the gratitude shown by the local community, when they see the end result of these objectives being delivered to them, which gives me, as an individual a feeling of pride, and in turn that you also, should attain this from your generosity. “Hopefully I will become a better player. I have already scored goals while playing in the Baku league championship. Usually I practice 4-5 times a week and have a regular football game on Saturday,” he said. “I have great faith in these kids. They are going to represent Azerbaijan very well on the international stage. I am pleased with the quality of training they get, and above that, sports help them to get more organized and wisely spend their time during the day,” said Arzu Alekperova, a mother of one of the players. 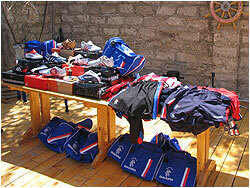 In support of the Baku Rangers, the Bears would like to thank Rangers Football Club’s merchandizing department for assistance with collection of kits. British Airways for transporting the equipment. John Wright for the donation of football boots, which Hedley Purvis transported to Baku.